Yesterday's lunch was almost a disaster. 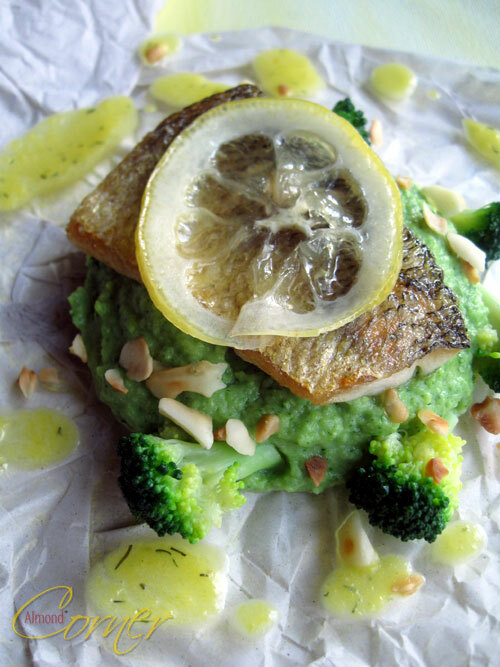 I wanted to prepare a lemon sabayon to serve with fish and broccoli puree with roasted macadamia nuts. The sabayon recipe called for egg yolks and lemon juice and zest. To be exact for 6 egg yolks and 1 teaspoon of lemon juice. I thought it is not possible, that this is going to work, but as it is a recipe by one of my favourite chefs, I halved it and decided to try. As I thought, it was a disaster, but it is my fault. I have only read the ingredients, but not the recipe, where it also says to add some water. Though, I should have came to the idea of adding some liquid anyway. So quickly, I had to look for another sauce, and as I liked to idea of leek, I looked for a sauce with leek and found Roux's leek coulis with saffron. In some way I also wanted to use lemon in the dish so i made some candied slices of lemon and served it on top of the fried fish. By the way the fish this time is a Coregonus species, that are known as whitefishes. Half and wash the leeks, then slice them finely. Bring water to the boil and blanch it for 2 minutes. Melt butter and sweat leek over low heat for 10 minutes. Add stock, saffron and cook over medium heat for about 10 minutes. Add cream and cook for another 5 minutes. Whiz mixture then strain through a sieve, season with salt and pepper and add dill just before serving. Some weeks ago I've bought at least 5 different kinds of pumpkins, that are still waiting for being cooked. Somehow I just didn't want to accept the fact that it is indeed already pumpkin season. So yesterday, finally, I decided to prepare something. 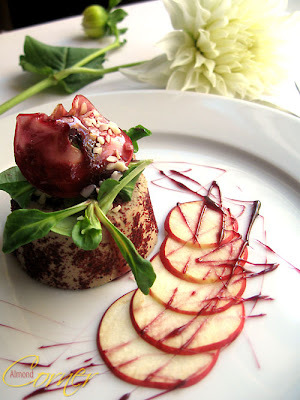 I thought panna cotta is not such a bad idea. 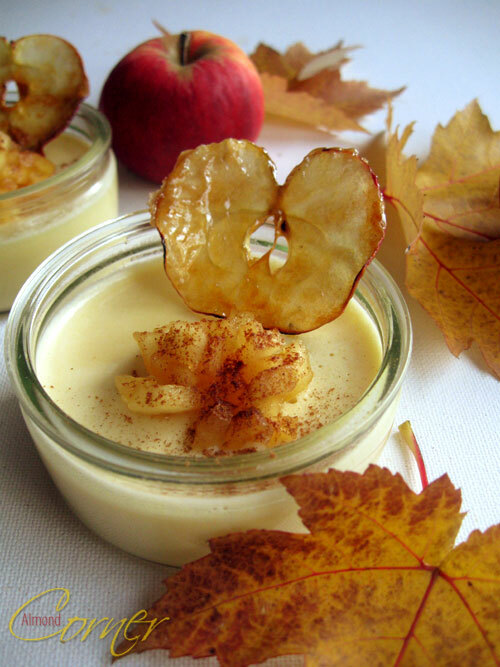 First i wanted an apple panna cotta with caramlised pumpkin, but then the pumpkin ended up in the panna cotta and the apples in the caramel. 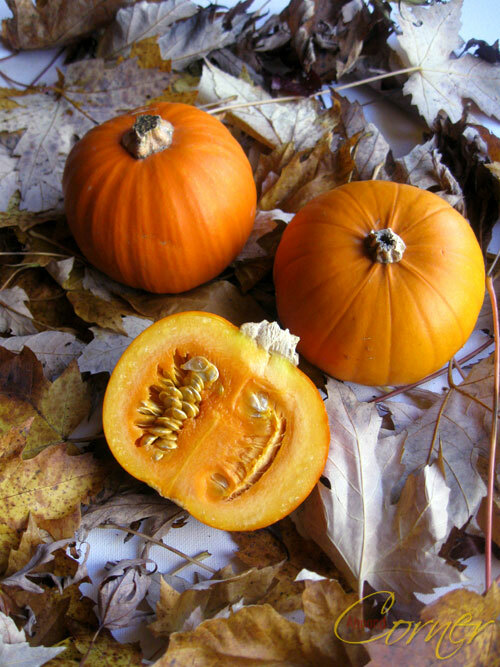 Put the peeled and deseeded pumpkin into a pot together with the spices, honey and enough water to cover it and cook until soft. Remove the spices and puree, then press it through a sieve. Soak gelatine for 5 minutes in cold water. 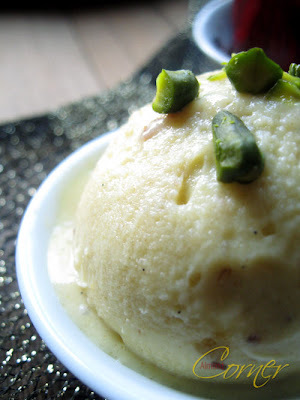 Bring cream together with sugar to the boil, add gelatine and mix well. Pour it into glasses and put it to the fridge for 3-4 hours. Before dicing the apples, set 4 thin slices aside. For the apple ragu melt butter and sautee apple for a few minutes, add sugar, caramelise and add port wine and cook for 5 minutes. Sprinkle apple slices with lemon juice and sugar and caramelise over medium heat in a frying pan. Serve panna cotta with the apple ragu and the caramelised apple slices. It's been a long time that I had a real good pear, juicy and fragant. There are many different types availbale, but somehow lately they are always too "floury". My favourite is Willimas, but even those are a disappointment lately. And when I buy a green one, I always forget it about it and it is already over ripe when I want to eat it. That is exactly what happened now, and as I did not want to bake, I decided to cook a jam. Peel and deseed the pears and cut in cubes, then bring it to the boil together with sugar, lemon juice, vanillapod and seeds and chopped lemongrass. Cook for about 1-1 1/2 hours or as long as it has reached the desired thickness. Put it into jars and let them cool covered by a blanket over night. 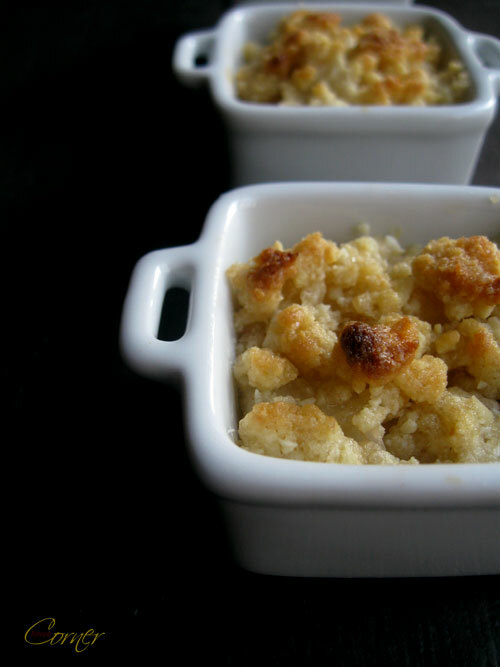 Crumble is a typical British pudding containing stewed fruit, topped with a mixture of butter, flour and sugar, served with custard or ice cream. The topping can contain spices like cinnamon, ginger and ground or chopped nuts and/or oats. 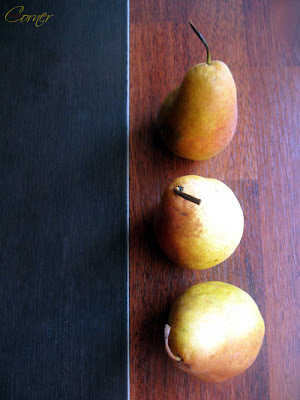 Commonly used fruits are apples, pears and berries. 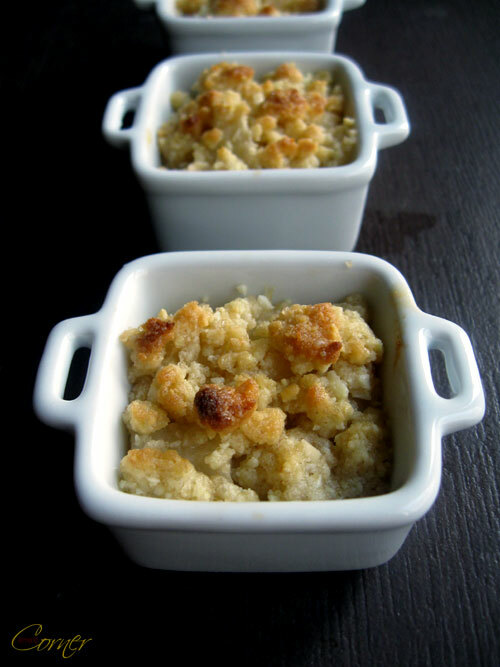 Crumbles originated in Britain during World War II. 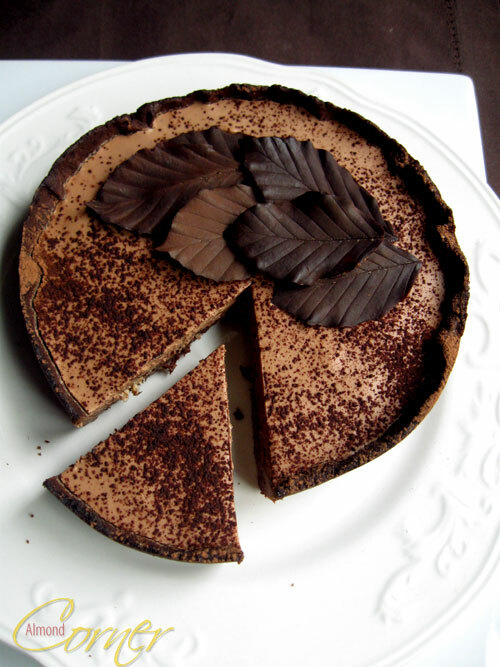 It was born due to the strict rationing of the ingredients required to make a pastry. Crumbles were the perfect alternative, using a small amount of flour, sugar and butter. 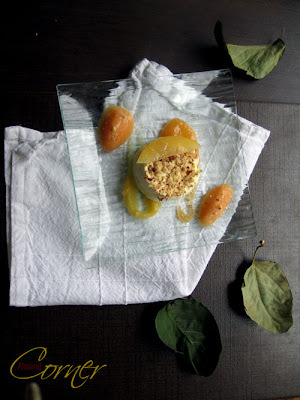 As lately I can't get enough of quinces, I decided to prepare a spicy quince crumble on a rainy autumn afternoon. For the quinces put everything into a pot and add enough water so that the quinces are covered. Bring it to the boil, then reduce the heat and simmer over low heat for 50-60 minutes or until soft. You can let it stand over night or remove it from the liquid and let it cool. For the crumble cut butter into small dice. With the help of your fingers rub it into the brown sugar, vanilla sugar, ground almond and flour. Do not mix it too much! Put it to the freezer for 30 minutes. Preheat the oven to 190°C. Fill ramekins with the sliced fruit and top with the crumble. Bake for 15 minutes. 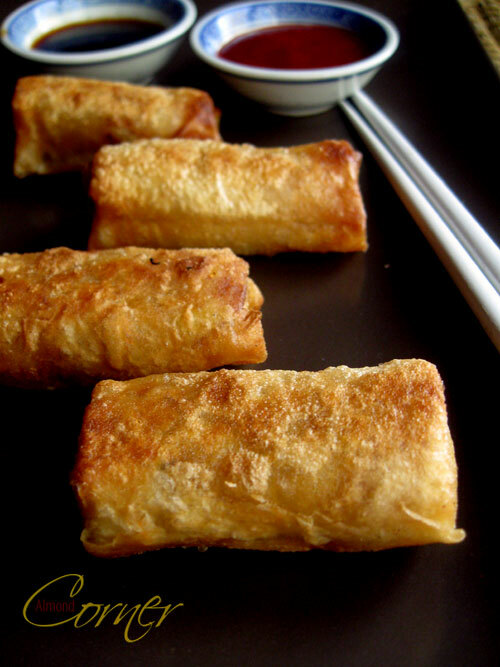 These spring rolls were born after 2 days of researching about homemade wrappers. Basically, I have found 3 ways of making these wrappers: the simplest recipe calls for a usual dough, that is rolled out very thin, but this one I didn't like and it didn't seem too authentic. 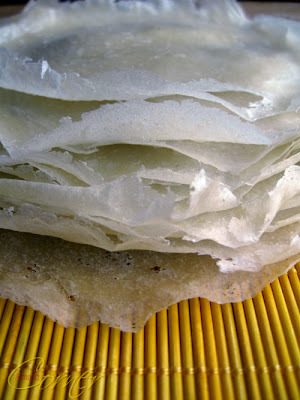 The other used rice flour and was baked like a crêpe. It seemed to be easy to go for it, so I prepared a bunch, but it just wasn't crispy enough. It was time to seek for a recipe for the 3rd way: a thick wheat flour dough. To make the wrappers one has to dip one hand into the dough, then smear it quickly and smoothly on a flat frying pan. The temperature of the pan is very important, it should be medium hot. I can't tell you, how happy I was when the third wrapper turned out as it supposed to be! For the wrappers combine flour and water and let it stand for at least 3 hours. Beat for about 15-20 minutes or until it becomes elastic and smooth. Heat a flat frying pan over medium heat and once it is hot lower the heat slightly. Dip one hand into the dough and rub it onto the pan. See video. For the filling slice vegetables julienne and fry in sesame oil together with freshly grated ginger for a minute, add bean sprout, some soy sauce and let it cool. 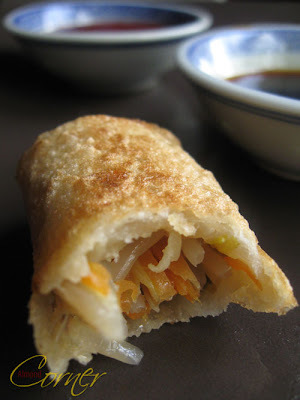 Fill the wrappers with the vegetables and deep fry in oil. 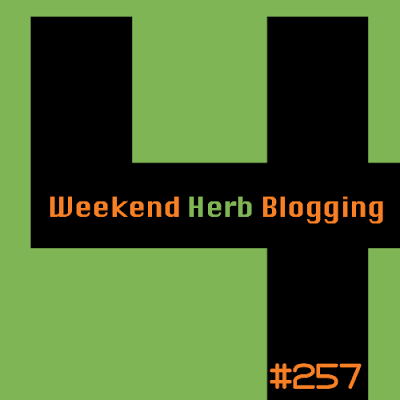 It is the 4th time that I am allowed to host the Weekend Herb Blogging, that is taking big steps towards its 5th Year! 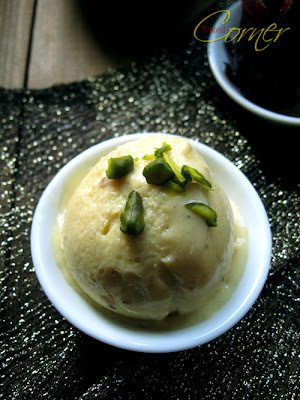 A weekly blog event created by Kalyn of Kalyn’s Kitchen and now managed by Haalo, of Cook (almost) Anything At Least Once. I am looking forward to your entries! Here is what you have to do: prepare a recipe using herbs, vegetables, plants, edible flowers or fruit on your own blog, and email the link over to me ( almondcorner [at] gmail [dot] com) before Sunday the 31th October. It is great to back to host this great event after such a long time! I decided to post about quinces, because this year is the first time when I can say I do love quince. It is such an aromatic fruit and it is absolutely beautiful. The quince is the sole member of the genus Cydonia and native to warm-temperate southwest Asia in the Caucasus region. It is a small deciduous tree, growing 5–8 m tall and 4–6 m wide, related to apples and pears, and like them has a pome fruit, which is bright golden yellow when mature, pear-shaped, 7–12 cm long and 6–9 cm broad. The fruit was known to the Akkadians, who called it supurgillu; Arabic سفرجل safarjal "quinces" (collective plural). The modern name originated in the 14th century as a plural of quoyn, via Old French cooin from Latin cotoneum malum / cydonium malum, ultimately from Greek κυδώνιον μῆλον, kydonion melon "Kydonian apple". The quince tree is native to Iran, Armenia, Azerbaijan, Georgia, Pakistan and was introduced to Syria, Croatia, Bosnia, Turkey, Serbia, Republic of Macedonia, Albania, Greece, Romania, Hungary, Ukraine and Bulgaria.In Europe, quinces are commonly grown in central and southern areas where the summers are sufficiently hot for the fruit to fully ripen. They are not grown in large amounts; typically one or two quince trees are grown in a mixed orchard with several apples and other fruit trees. Charlemagne directed that quinces be planted in well-stocked orchards.The seeds contain nitriles (RCN), which are common in seeds of the rose family. In the stomach, enzymes or stomach acid or both cause some of the nitriles to be hydrolyzed and produce HCN (hydrogen cyanide), which is a volatile gas, not likely to remain at the scene for long. The seeds are only likely to be toxic if a large quantity is eaten. (source:wikipedia) Well, no need for the seeds in my recipe for quince mousse. First prepare the pâté à bombe: bring a pot of water to the boil and whisk together the egg yolks with cold water and sugar and put into the pot with the simmering water (the water should touch the pot with the egg yolks-sugar mixture) and cook while whisking for 40-50 minutes or until it is thick. Let it cool, sieve and beat it with a mixer until foamy. Peel quinces and poach them in a syrup cooked of 400 ml water and 100 g sugar together with the spices and let the quinces cool in the syrup. 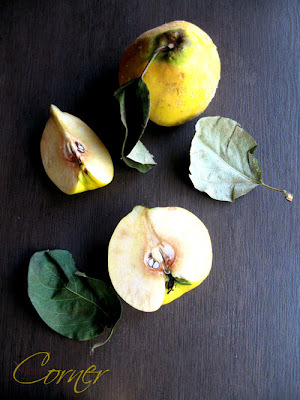 You can also preare them the day before and leave quinces in the spicy syrup overnight. Puree and set 85 g aside, the rest can be served with the mousse. 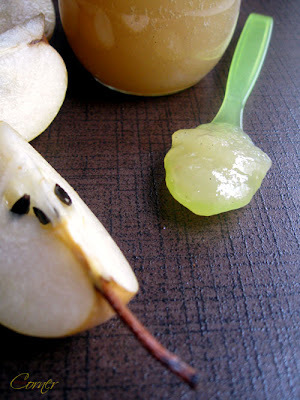 Soak gelatine in cold water and stir it into the warmed puree. 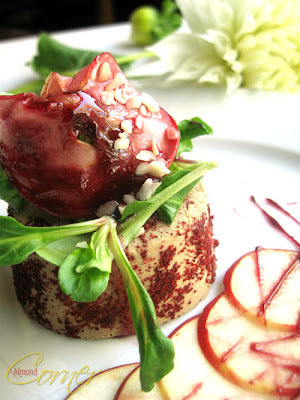 Let it stand for 5-7 minute and stir in 56 g of the pâté à bombe, then fold in the beaten cream. Pour the mixture into forms and refrigerate for 4-5 hours. Lately, I was craving for liver pâté and as I was curious I checked some ready made products in a store. I took a small can of calf liver spread and I almost didn't believe my eyes when I read that it contains about 56% of pork meat, 12% of pork liver, 8% of calf meat and 2 % calf liver. I checked the cover of the package to see if I indeed had a calf liver spread in my hands, and yes I did. Of course I already had fresh beef liver in my basket, because it was clear from the begining, that I am going to make the spread myself. This time I didn't go for the rustic version, but prepared a smooth parfait and served it among apples with red wine caramel, homemade raspberry powder and raspberry vinegar marinated salad. 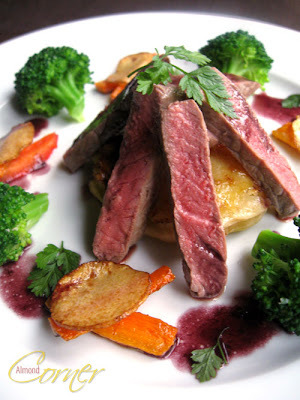 Fry sliced beef liver over medium heat, add port wine and reduce. 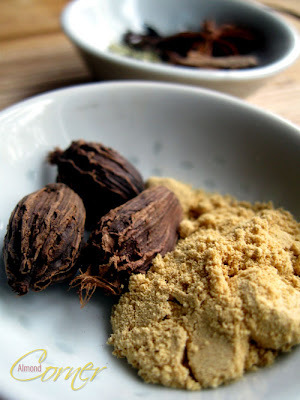 Blend liver to a paste in a food processor. In the meantime heat cream. Add butter to the liver and blend again, season and add hot cream and blend once more. Sieve and pour it into individual forms or in one big and cool for 5 hours. While frying the liver feel free to add chopped onion or garlic, thyme or some majoram. 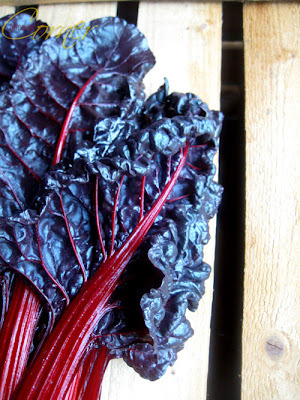 The truth is, that I am not a fan of Swiss chard at all, unless it comes in a form of a puree, but eating sauteed leaves, brrr, that is not my cup of tea. The same with spinach, I do not like cooked spinach, but fresh baby spinach in a salad is indeed awesome, or a spinach sabayon or a cream, but no leaves please. Once in a while I like to give these vegetables a new chance in their "leaf form". 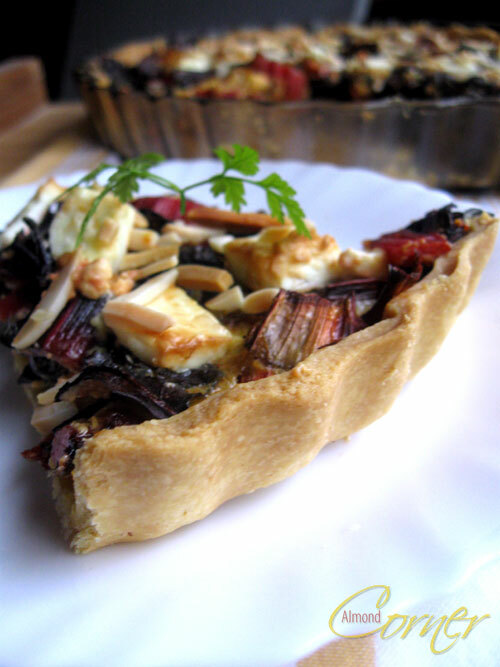 This time I couldn't get home without this beautiful bunch of red Swiss chard from my greengrocer, and I decided to give it another go in a form of a quiche. Put the flour in a large bowl and add the butter, salt, sugar and egg into the middle. Rub these ingredients togehter with your fingertips. Then rub the butter mixture into the flour until it resembles coarse breadcrums. Add the milk and knead a dough as fast as possible. Chill dough for an hour. The pastry can be kept in the fridge for a week or frozen for 3 months. Preheat the oven to 180°C. Roll out pastry about 2 mm thick and line a tart form and . Line the base of the pastry with baking parchment and then fill it with baking beans and blind bake for 15 minutes. Remove the beans and parchment and return to the oven for another 5 minutes to cook the base. Let it cool. For the filling melt butter and sautee chopped garlic together with the sliced mangold stems for about 5-7 minutes,then add chopped mangold leaves and sautee for another 3 minutes. Season and let it cool. Whisk together the egg yolks, the egg and the double cream, season and pour it over the mangold, that it is already in the tart shell. 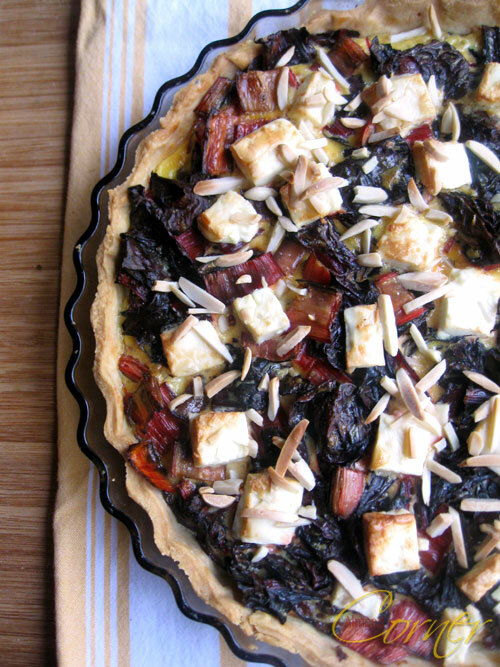 Sprinkle with almond and cubed feta cheese and backe for 30-35 minutes. 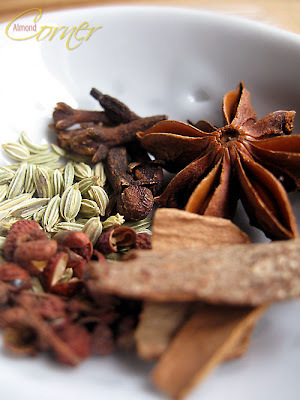 Lately, I spend a lot of time reading about Asian cuisine, spices and ingredients. When I cook something European, I always research about the history, the origin of a dish and try to find the original recipe and so on. However so far I have a very little knowledge about the Asian cuisine, besides the stuff you get here in the restaurants is not quite authentic anyway, but delicious, if you know where to eat. 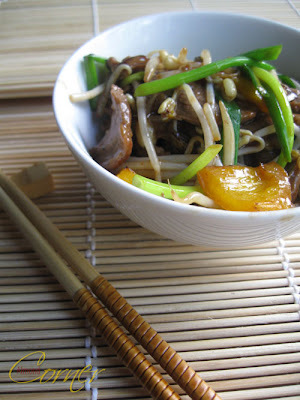 In search of creating a delicious stir-fry, finally, I can say, that I managed to prepare one that I am very happy about. Probably, not authentic, but addictive! It took me a couple of trials to get here. All I can say, less is more! Marinate thinly sliced meat in soy sauce, sherry together with 5 spice powder, sliced garlic and ginger and a chopped chili. Let it stand for at least an hour or over night. Heat sesame oil and fry the garlic, ginger and chili from the marinade, then remove. 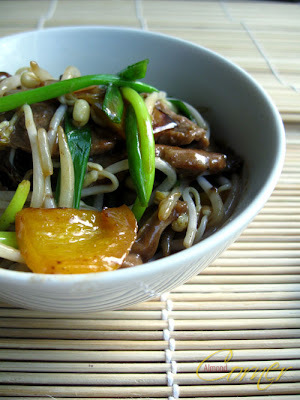 Sprinkle cornstarch over the meat and fry. 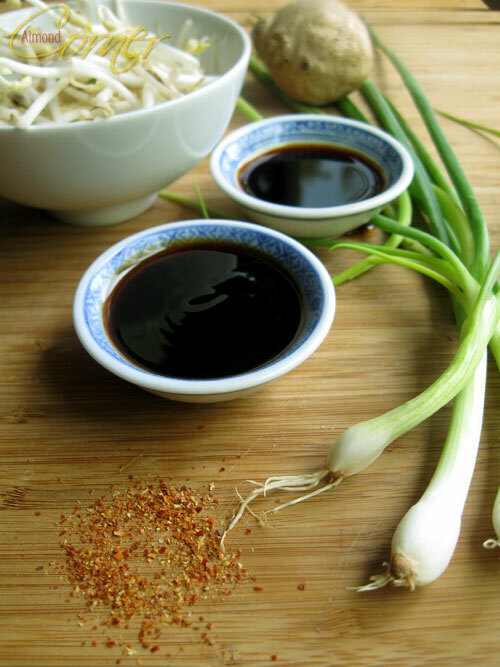 Set aside, add bell pepper, fry for a couple of seconds, pour a splash of black vinegar over it, add spring onions and bean sporuts among a splash of soy sauce and oyster sauce and the marinade. Put back the meat, mix well and serve. Bread baking is definitely not my cup of tea, at least not yet. Most of the time I end up with a hard, not edible bread. Twice I have tried sourdough, but the result was even worse. 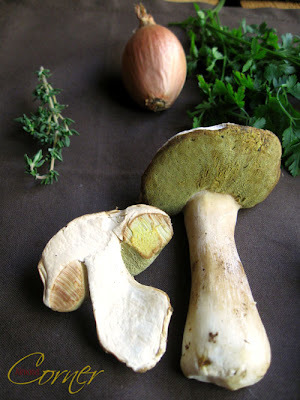 Today, craving for Hungarian flavours, I decided to cook a mushroom soup. While peeling the vegetables, I thought a nice slice of fresh bread would be perfect with it. I looked for a quick and easy recipe. 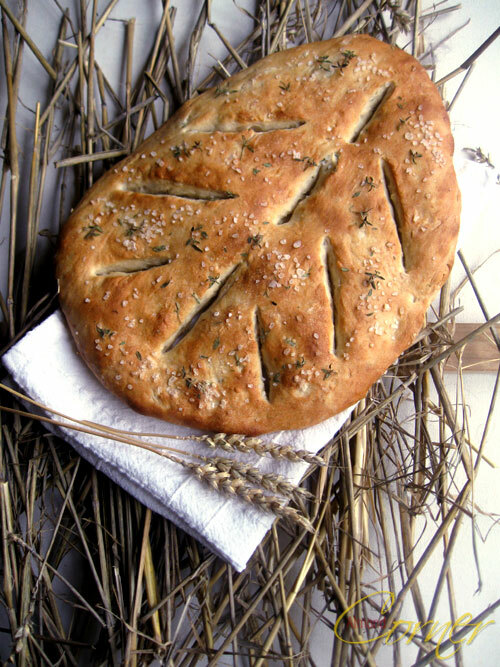 Fougasse just seemed to be the right choice! Sieve flour, add dried yeast, salt, thyme leaves, olive oil and water and knead a dough. Let it stand for 30 minutes. Turn the dough onto a lightly-floured counter and flatten it out in a shape of a leaf and make cuts in the middle and on the sides (see baked bread photo). Brush with water, sprinkle coarse salt and thyme leaves on top and let it stand for 20 more minutes. Meanwhile preheat the oven to 220°C and bake for 15-20 minutes. 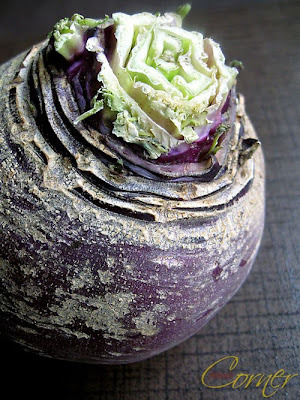 This time I decided to use this delicious turnip in a gratin together with potatoes as a side dish with entrecôte and red wine sauce. Preheat the oven to 180°C-ra. Butter a gratin form or small forms and rub with a garlic clove if desired. Peel potato and yellow turnip and slice with a help of a mandoline about 3-4 mm thick. Place 3 rows of potato on the bottom of the form, season with salt, pepper and nutmeg. Put 2 rows on yellow turnip on it, season and pour some cream over it. Repeat the process as long as the vegetables are all used. 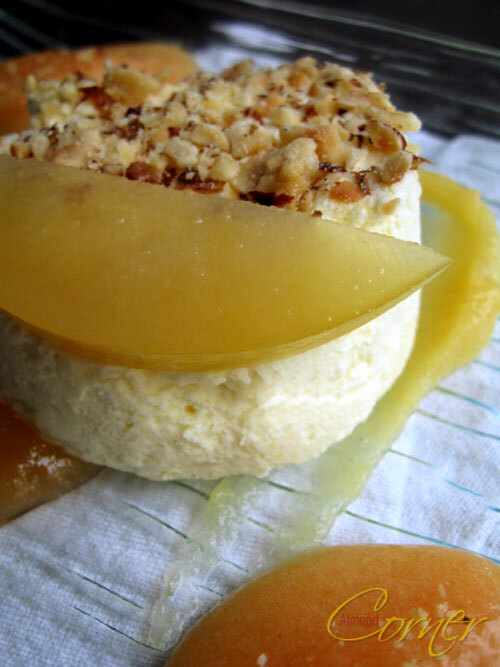 Season, pour cream over it and grated cheese. Bake for 45-50 minutes, or 20-25 if you use small forms. For the sauce melt 1/2 a teaspoon of butter and sautee chopped shallot, add red wine and veal stock, reduce by half, season with salt and pepper, and stir in the cold butter. Get the meat at least 2 hours before cooking out of the fridge. Heat a little olive oil and fry the dried meat slices from both sides for 1-1 1/2 minutes per side. Add garlic clove, rosemary, butter and sprinkle the molten butter over the meat. Set aside for 5-10 minutes. 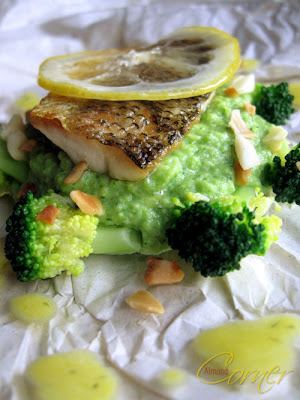 Serve with butter sauteed carrot, yellow turnip chips and broccoli. I submit this post to the WHB created by Kalyn from Kalyn's Kitchen, who passed it on to Haalo, of Cook (almost) Anything At Least Once, this time hosted by Chris from Mele Cotte. It is really getting cold outside! 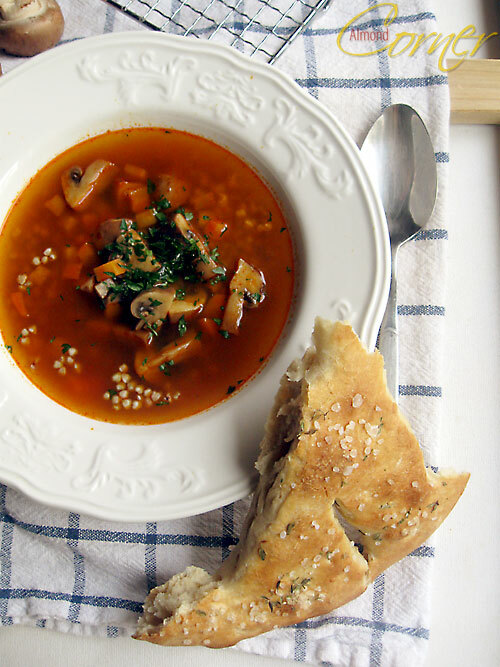 The perfect time for a warm vegetable soup. 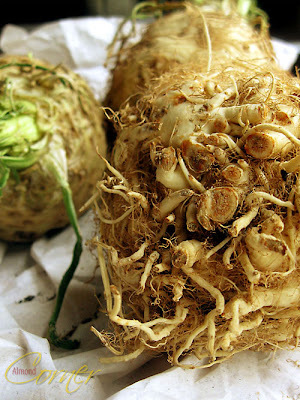 Last week I found some young celery roots and I decided to cook a cream soup. I wanted to keep it simple and elegant. 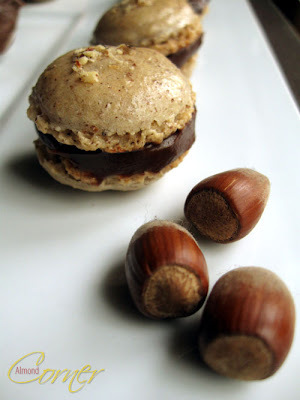 In order to bring a touch of sweetness I served it among some roasted chestnuts. Peel vegetables, slice leek and cut celery and potato in cubes. Melt butter and sautee leek for 3 minutes. Add potato, celery and stock. Cook for 15 minutes over low heat. Then add cream and cook for another 10 minutes. Blend in a mixer and season with salt, pepper and freshly grated nutmeg. Serve with oven roasted chestnut and some ground nut oil or olive oil. 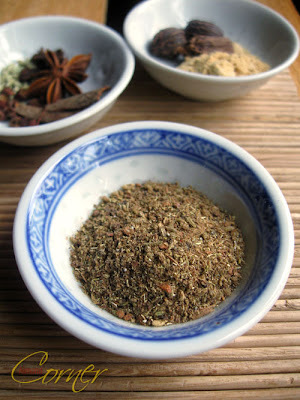 Five-spice powder is a mixture of five spices, encompassing all five flavors of sweet, sour, bitter, pungent, and salty. It is popular in Chinese cuisine, but also used in other Asian cookery. There are many variants. The most common is star anise (bajiao), cloves, cinnamon, Sichuan pepper (huajiao) and ground fennel seeds. 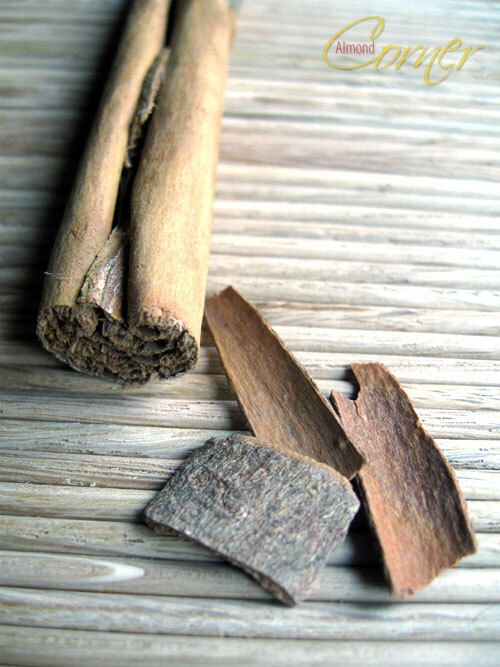 Instead of true cinnamon, "Chinese cinnamon" (also known as rougui, the ground bark of the cassia tree, a close relative of true cinnamon which is often sold as cinnamon), may be used. 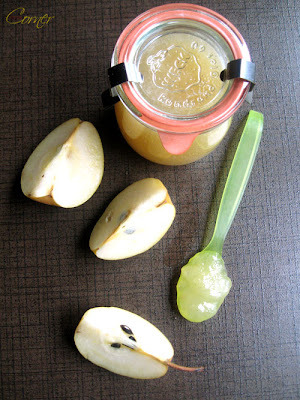 Simply blend all the ingredients together and keep it in an air tight container. Use it within 3-4 months. 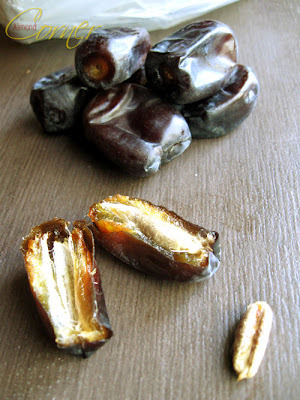 Last weekend, my greengrocer gave me some dates to try and I was totally surprised, because I haven't ever had such juicy and fresh dates. Of course, I had to take a box home with me. It is very important for me to cook using local and sesonal ingredients from local producers, but once in a while I grant myself some exotic fruits like a ripe mango or exotic spices. I try compansate or balance this (in order to calm my conscience) with not eating (of course not only because of that, I do not do that anyway) endangered fish spieces such as tuna, monkfish and so on. My favourite kind of date is the Medjool, I guess it is also called as the king of dates. 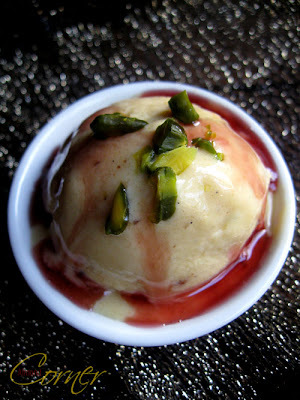 The one, I used in this ice cream, that was served with hibiscus syrup, is probably a Khadrawi date, but I am not sure, and I couldn't find it out. Bring milk with 2/3 of the sugar to the boil among the halved vanilla pod. Beat egg yolks with the rest of the sugar until creamy and pale. Pour boiled milk over the egg yolk mixture while stirring. Put it back to the heat and over very low heat, stirring with a wooden spoon, let it thicken until it is thick enough to cover the back of the spoon. Let it cool, best over night. Pit dates, remove the skin if possible, if not later when it gets pureed you can press it through a fine sieve. 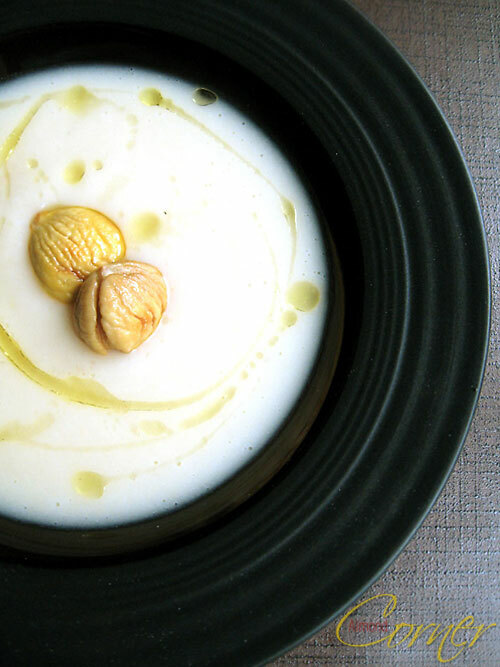 Cook chopped dates in sherry and rose water, puree and stir it into the cool crème anglaise. Let the ice cream maker do the rest of the work. I submit this post to the WHB created by Kalyn from Kalyn's Kitchen, who passed it on to Haalo, of Cook (almost) Anything At Least Once, this time hosted by Prof Kitty from The Cabinet of Prof. Kitty . Ehm...well, I know it was only yesterday when I said, enough chocolate. It is really not my fault... (*grins*), but while organising the fridge I found some leftover milk chocolate ganache and also some aged egg whites. It would have been a shame to throw them out, right? So I decided to bake hazelnut macarons, by the way for the first time, and fill them with the milk chocolate ganache. 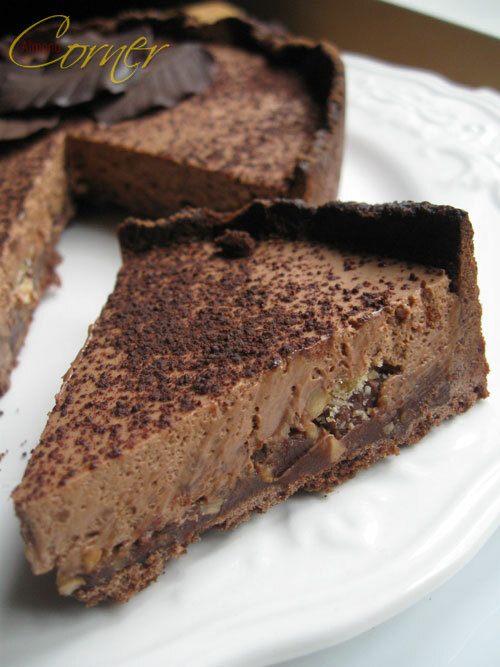 Actually, I am not a fan of milk chocolate, but it made a pretty nice filling among some crushed, roasted hazelnuts. Preheat oven to 150°C. 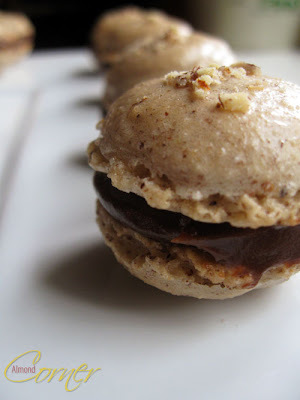 Sift together powder sugar and hazelnut flour, or use a food processor for this. Beat egg whites, until they form a peak, add 2 drops of lemon juice and a pinch of salt bring to a foam like texture then progressively add the sugar. Add half of the powder sugar and nuts to the beaten egg whites and mix well using a rubber spatula. Once the mixture is well blended, add the remaining powders and continue to blend together. 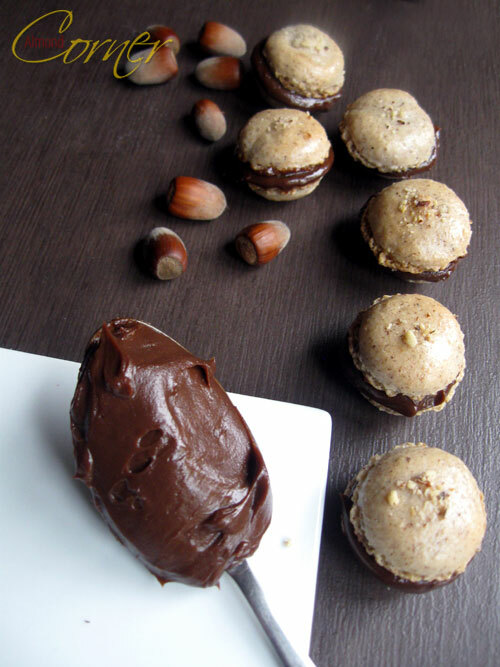 Pipe out the macarons onto a silicon sheet or greaseproof paper and let it stand for 30 minutes. Bake for 13 minutes for small macarons and a few more minutes for large macarons. Let slightly cool before removing the macarons from the silicon sheet. For the milk chocolate ganache cream 75 g butter in a bowl, and chop 90 g milk chocolate and put it in another bowl. Bring 55 ml milk to boil and pour it over the chopped chocolate and whisk it together with a help of a wooden spoon. As soon as it has reached 60°C stir in the butter. Enough chocolate - at least for a while! I do not think, that I am going to bake anything with chocolate very soon, but of course one never knows. 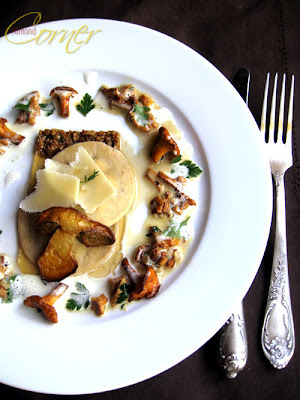 At the weekend I found beautiful porcini and I was planning to make risotto, because that is just so good that nothing can beat it, but then I let my thoughts free. 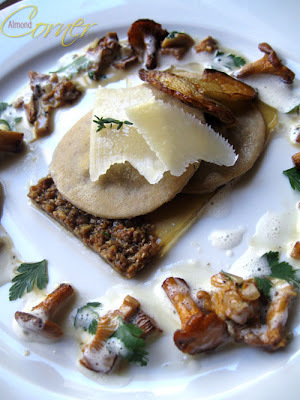 For me this pasta dish is kind of an ode to porcini. First of all, I prepared a porcini gelée of reduced porcini water and chicken stock, so that at the end I had a very concentrated, intense porcini flavour. Usually, I am not a jelly fan at all, but lately I have managed more than once to prepare a jelly with a nice consistency. For the ravioli I prepared the pasta dough with dried porcini and used the fresh ones for the filling. The whole thing was served among a thyme foam and a chanterelle sauce with rich veal stock and sherry. Those sauces are nothing new, the thyme foam is based on an earlier basil foam, that I prepared for a fish dish and the chanterelle sauce is just the same like the one I served with the herb patterned pasta. 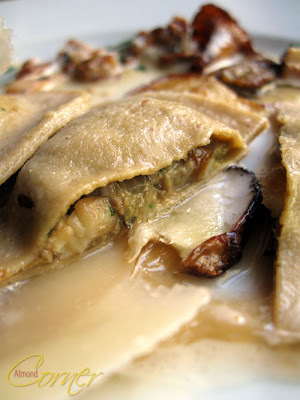 Just imagine how the porcini gelée melts under the warm ravioli and the pasta soaks it all in, what a beautiful intense flavour! Whisk flour, semolina and ground porcini together. Make a hole in the middle and slowly add whisked egg and with a help of a fork mix it together. When the dough is getting viscous knead it with your hands until it is smooth. With a help of a pasta machine roll out pasta dough and place a teaspoon of the filling on it and make ravioli with a help of a form or anything you've got and cook it in simmering salted water for 2-3 minutes, depending on the thickness of the dough. For the filling chop shallot and porcini. Heat olive oil and fry porcini until almost golden brown, add shallot and fry until it is softened. Now season with salt and pepper and add chopped parsley. Let it cool. When cooled stir in some crème fraîche (I used homemade according to this recipe, it is gorgeous!. Fall is here with its wonderful colours. 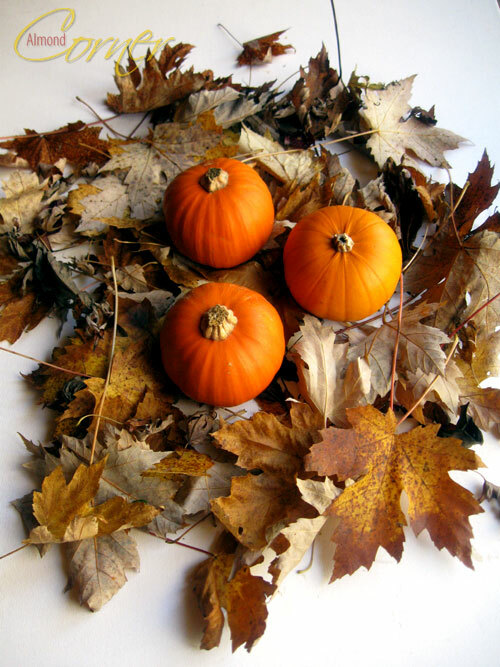 Why not take those leaves inside to decorate a cake with them? There are still some green leaves, that are perfect for coating with chocolate to make chocolate leaves. 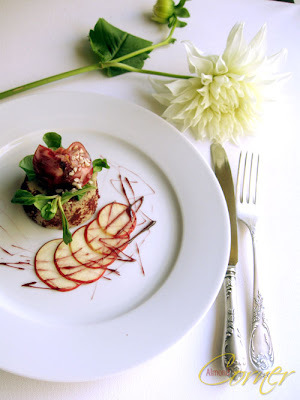 I can say, that I grew up on chocolate rose leaves, because my mom used to make them often. I remember that I collected the leaves in front of the house for her and watched her making the leaves with huge eyes. The best are rose leaves or other that have the same character, or are a little bit less strong, but the very soft ones or hairy leaves are not appropriate, because they might stick into the chocolate, and I bet nobody wants hairy chocolate leaves. 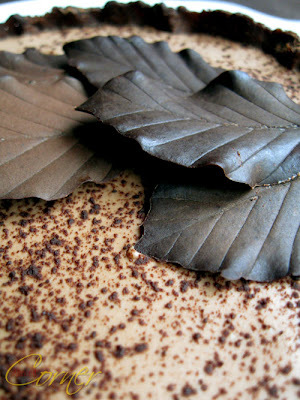 I have decorated a chocolate mousse and caramel chocolate ganache cake with some cute leaves. First chop chocolate and temper the following way: place chopped chocolate into a heatproof bowl. Put water into a pot and place the bowl on top of the pot. Make sure the bottom of the bowl doesn't touch the water. As soon as the chocolate has molten completely, the temperature should be 55°C. Remove the bowl from the bain marie and put it into another bowl with ice water and stir chocolate with a wooden spoon until it reaches 27°C. Immediately put the bowl of chocolate back on top of the pot with the hot water and while stirring and controlling the temperature let it get 30-33°C warm. Now the chocolate is tempered and ready to use. With a piece of wet cotton clean the back of the leaves, then let them dry. You can either dunk the back of the leaves into the tempered chocolate or brush them. 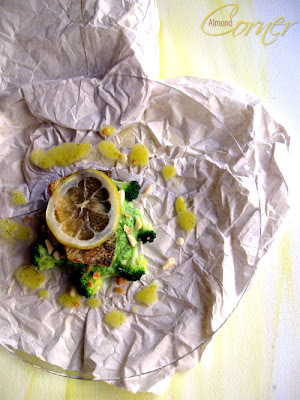 Let them dry on a greaseproof paper in the fridge for 15 minutes. Now brush them with another layer of chocolate and leave them in the fridge for another 30 minutes. Then take each leaf and carefully peel away the leaf from the chocolate.